Thanksgiving is quickly approaching. If you have a dog in the house, you can have a happy Thanksgiving with a dog around. Here are some tips to help you and your dog enjoy Thanksgiving. Yes, you need to plan. Are you going to travel or will you be staying home? If you are staying home, make sure your dog will get along with all ages of people in your family. 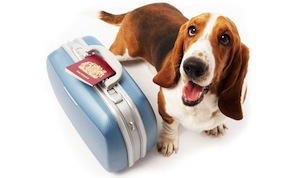 If you are traveling, line up an In Home Pet Sitter, now. Chances are, if Fido attending Thanksgiving at an out of state gathering, things will not end well. Fido will enjoy being home and being in familiar surroundings. If you do travel to another family member’s home, make sure that your dog is welcome. You, yourself, may also benefit if snacks are limited. When you limit the snacking for yourself, this does not give you permission to hand them all over to your dog. Your dog needs to eat the things that he/she can digest well. How about baking some homemade dog treats? Your garbage can may be one of the most dangerous things of the Thanksgiving holiday when it comes to your dog. Those turkey bones and other foods can damage your dog’s digestive system, as well as bring challenges with lodged bones in their throat. Plastics and aluminum foil are also other items that you need to pay attention to. These two items will not set well with your dog. Most importantly, embrace Thanksgiving and enjoy being together with family. Remember that it’s ok to leave your dog in the care of others, as this may be the smartest thing you can do to keep your dog safe over Thanksgiving. Are you in need of an In Home Pet Sitter? Give us a call at 321-794-4477.